Parallel Access Volumes and Multiple Allegiance are features used by z/OS mainframes to speed up disk access. One of the problems with mechanical storage disks is that they are single threading; Only one process can access the data on a disk at a time. z/OS managed this by allocating a Unit Control Block (UCB) to each storage device. If several applications wanted to access a device at the same time, then the IO operations were queued up by the IO supervisor. In performance terms, this is called IOSQ delay. IOSQ is an especial problem for disks with several very active datasets, and storage administrators allocated busy databases, RACF files, HSM control files, Page and Spool datasets etc. on their own dedicated volumes. This required careful monitoring, and manual effort to change. The principle behind IOSQ is illustrated in the GIF below. 4 applications are trying to access a JBOD disk. (JBOD is the opposite of RAID. The acronym is Just a Bunch Of Disks and it means one simple disk assembly) When an application turns green, it is successfully getting to the disk. The other applications are queued, waiting for their turn. Modern disks subsystems do not have this physical restriction. Flash disks do not have read heads, so they do not have the single thread access restriction. Spinning disks are virtualised, so the data for one virtual disk is spread over several physical disks. Also, all write IOs go to solid state cache and over 90% of read IOs come from cache. It is possible to schedule concurrent IOs to a cache as it has several access paths, but z/OS was unaware of the physical implementation behind its virtual disks. The UCB architecture still said that only one IO was allowed to a disk. PAV was introduced to fix this. The concept behind PAV is that every disk has its normal 'base' UCB and also a number of 'alias' UCBs, all of which connect to the logical disk. This means that it is possible to schedule concurrent IOs to a disk, one through the base UCB, the rest through alias UCBs. If there are enough alias UCBs available, IOSQ should not happen. STATIC means you specify how many PAV aliases each BASE (the real UCB) alias can have, and then that number is fixed. DYNAMIC means you define just a bunch of aliases, and workload manager decides how many aliases are needed by each base aliases, depending on how busy the virtual disk is, and how important the application is. However Workload Manager can take a while to work out that a disk is busy, and will not eliminate IOSQ completely. DYNAMIC PAV needs fewer aliases than Static PAV and performs better, as more aliases are available for busy disks. Dynamic PAV has two problems; it uses up a lot of UCB addresses and it takes workload manager a while to notice that a disk is busy and needs more aliases. HyperPAV is designed to fix these problems. HyperPAV keeps all its aliases in a pool and just assigns one to a volume when it is needed to service an IO. It does not use WLM to decide when to allocate an alias. Each HyperPAV host can also use the same alias to service a different base, which means fewer aliases are needed. HyperPAV then requires fewer aliases per base, I've seen a ratio of one alias to 4 bases work well, but your requirement will depend on your workload. HyperPAV is especially useful if you are planning to use EAV volumes. 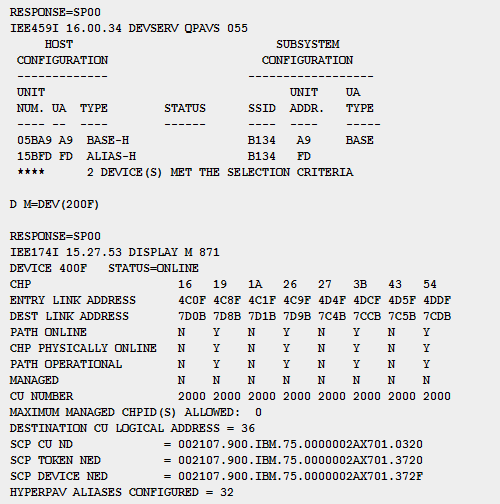 Hyper PAV allows you to share aliases between disks in one logical control unit (LCU). Super PAV allows you to pool and share PAV aliases between LCUs. 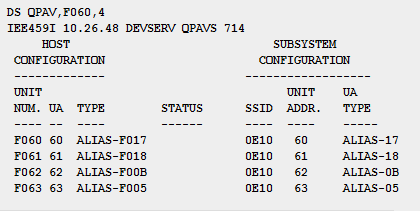 If you set MIH times in SYS1.PARMLIB(IECIOSxx), then IBM recommends that you do not set them for PAV alias devices. Define a number of PAV aliases to every disk in your disk subsystem. The total number must match the HCD. You can enable HyperPAV dynamically, but IBM recommends that you do this at a quiet time, with no other configuration work running on a DS8K. You use the command . Hyperpav requires z/OS 1.8. or higher, although fixes are available for earlier z/OS releases. It is supported by the latest IBM, EMC and HDS (including HP) devices, but usually needs a chargeable code upgrade. It will only work with FICON channels, ESCON is not supported. Be sure to define the same types of PAV on the same range of volumes for each LPAR. 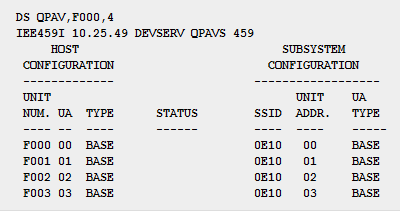 There are three volumes using dynamic PAV and five on DS8K using HyperPAV as indicated by the 1.0H in the PAV column. One dynamic PAV volume has 2 aliases and a bit of IOSQ wait, but all the hyperpav volumes have one alias and no wait. PAV addresses queuing issues with IOs coming from the same CPU or LPAR. If a disk is shared between several CPUs or LPARs, when an LPAR gets control of a device it puts a hardware reserve on the disk, to prevent others from interfering. Multiple Allegiance removes that requirement, and lets the storage controller manage cross system IOs. You do not set up MA, or switch it on. If your disk subsystems are MA capable, it happens.